The brainchild of Timber Timbre members Simon Trottier and Olivier Fairfield, Last Ex was born out of an unused ambient score that their primary musical project composed for a horror film in 2012. 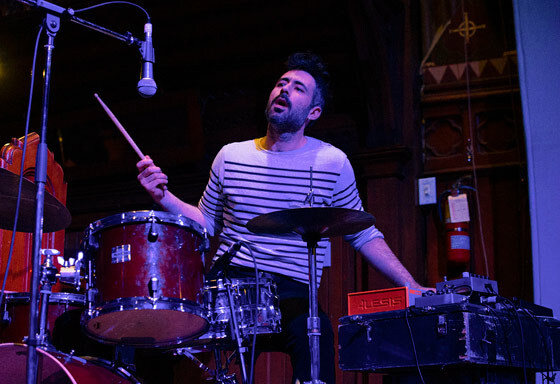 Revisiting the techniques and musical textures used in the unreleased material, the duo brought their instrumental blend of rock, musique concrete and experimental sounds to the stage to kick off their February tour. No doubt the busiest member of the group throughout the entire set, drummer Fairfield's attention was divided between both his drum kit and a small number of synthesizers. At times, this forced him to play a keyboard melody with one hand, while keeping time on the kit with the other. While certainly no easy feat, he made it look effortless in providing the perfect accompaniment to Trottier's twang-y six-string work. He would often kneel down to his vast array of pedals to modify his guitar signal, at times giving way to fleeting string arrangements from violinist and Timber Timbre collaborator Mika Posen. Enthralled by the group's performance, many in the audience left feeling much like the impressive display of cinematic sound they had just witnessed — speechless.